Every team played a total of 4 regular season games at the 2018 BSC. The top 8 teams with the best records advanced to the playoffs. The 2018 BSC Champions: Strong Island Stunnaz! 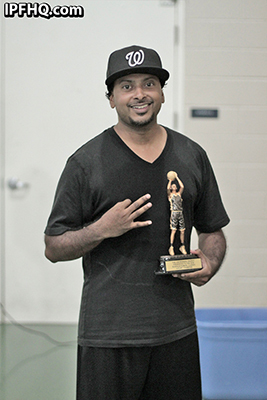 Official RECAP to the 2018 IPF Sports Tournament - 16th Annual Blessan Samuel Classic!! Strong Island Stunnaz!! Pictures have been added from the 2018 BSC/2018 IPF-VBC. 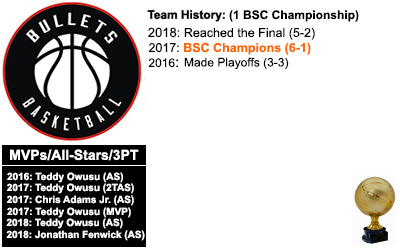 Full BSC Tournament Recap - Congrats to the Strong Island Stunnaz on winning their first BSC Championship! GAME OF THE YEAR: Baltimore Bullets VS Strong Island Stunnaz - Regular Season/Championship. Take your pick as to which of these games warrants this distinction!! Shout outs: I want to take this time to shout out the following people. Without their help, this event could not have happened. Crystal George, Charles Thomas, Calvin Thomas, Melvin George Joshua Kurikeshu, Justin George & all the players who helped out. To anyone I missed, many thanks for your support. Strong Island Stunnaz: For so long the tourney has been dominated by the likes of DC, Philly, Chicago, TO, & BK. Ladies & gentlemen, we'd like to introduce the new kings of NY - The Strong Island Stunnaz. 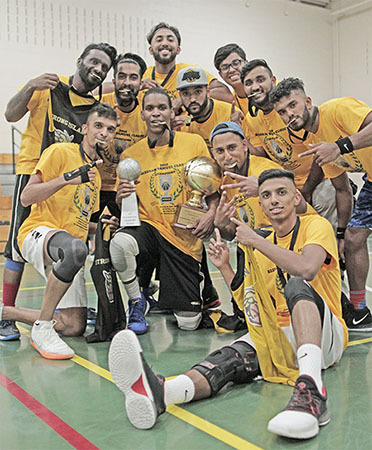 The addition of Jabar played a major factor in their success, but it was ultimately their outstanding team play that propelled them to an undefeated championship season. 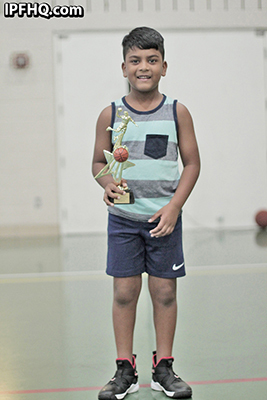 Abel’s point guard abilities have gradually improved over the years, which allowed for Jabar to get buckets at his more natural off-the-ball position. Add on Veteran Leadership by Bensen Oomman, clutch shooting by Benson Alexander and Shane’s solid inside presence, this team just had all the right ingredients to win the chip this year. Congrats fellas, way to rep the Empire State the right way! Baltimore Bullets: The Bullets were a few points away from a two-peat. 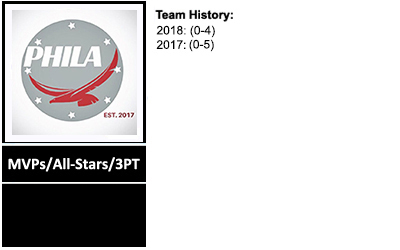 Behind the strong play of their all-star guards, Teddy and Jonathan, this squad pushed through the regular season and eventually to the finals. After an exciting double overtime loss to the eventual champs in the regular season, many had a feeling that it would be a finals rematch between these two teams. They still have the championship DNA and a Baltimore toughness that can’t be replicated. Look for this team to come back with a vengeance next year. Newark: Led by their first team all star, Aby & second team all star, Jacinth, this tough, gritty young team made the semis 2 years in a row. They blew out a veteran Philly team in the first round of the playoffs before running into a finals bound Baltimore team. The Brotherhood continues to turn heads and are next up to really win it all. 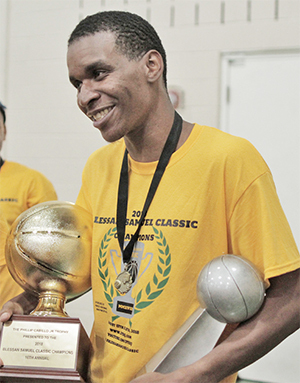 DCZ Finest: Championship pedigree & will to win were the two elements to their season. 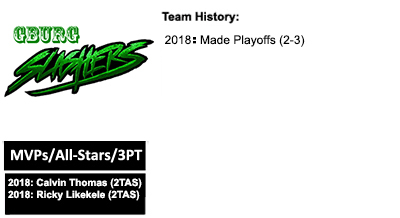 With a team of only 5 players and sometimes running games with 4, the most dominant team in BSC history managed to get to the second round of the playoffs & kept it close with the Stunnaz. 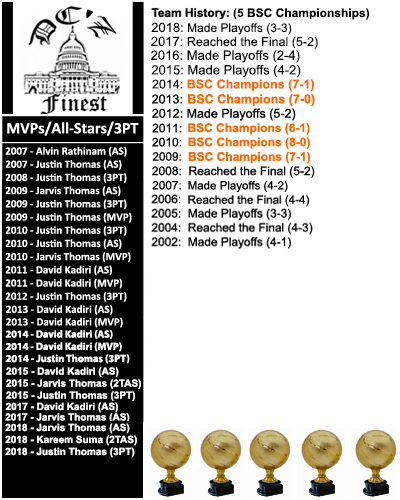 Jarvis Thomas is one of the highest-IQ players the BSC has ever seen. He did a lot of his damage from the post this year and got to the line frequently earning him first team honors with 50+points. Kareem is only a 12th grader with elite finishing ability, so his future in this tourney is scary. Richard stepped up with his all-around contributions. Philly Ballazz: You hear it every year – “it’s our last year” - there’s something to be said about their brand of basketball and proving naysayers wrong with excellence in team chemistry and overall IQ of the game. These are the factors that helped them press towards a winning season & a first round playoff appearance. Although they lost to a tough young NJ team, they are still in the discussion for teams that can do damage. Shout out to Ricky, Vinil, and Jithin with their solid play. Gburg Slashers: This was their best year as a team. They lost their two games the first day; this motivated them to win the remainder of games the second day. The team chemistry is really coming together and is evident in their gameplay. 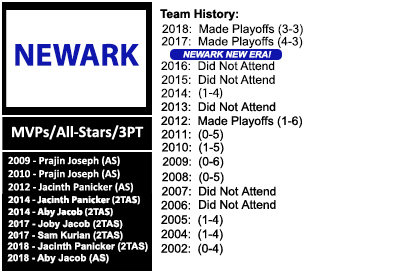 Led by their two 2nd team all-stars, Calvin and Swiss army knife, Rucky, great shooting from Preston and Naveen, and the growth in Joshua Thomas, this team is a few pieces away from making some serious noise. Amazing to see how the young talent in this tourney is growing and now even competing in games as they did in the playoffs vs DC. It was an exciting matchup that came down to the wire. Keep grinding, Slashers! 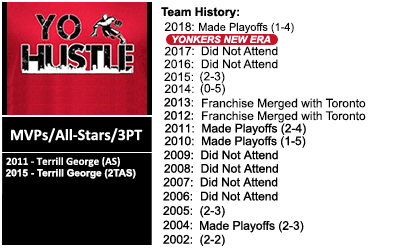 Yonkers Hustle: After a three year absence, the Yonkers Hustle returned the to the BSC and earned a playoff appearance. Led by a strong performance from team captain, Justin George, and important contributions from James George & Terrill George, Yonkers was in winning position in 3 out of the 4 regular season games it played. The talent level is there, time to take the next step in 2019! Chicago UntouchaBULLS: Strong showing by this young team supported by the veteran leadership of Josue and seemingly ageless Joey. The play of their high schoolers, Danny & Jerome, really impressed many. Even though they lost, they kept a 1vs8 seed game close and thrilling till the champs took over. With a couple more years of experience and continued growth, this team has the potential to be dangerous in the future. Philadelphia Flight: Great play by Boaz, Binu and solid addition of Allen. They were missing their young up and coming stars but definitely fought in every game they played. They’ll be sure to bring the fight back in flight in 2019. 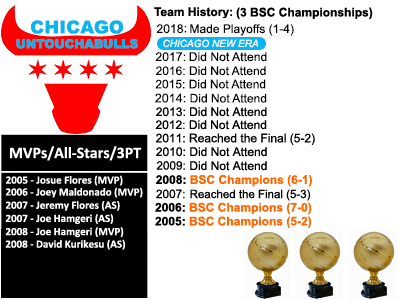 2019 BSC First Look: As the BSC moves to our 17th year, we are in our most competitive ERA ever. 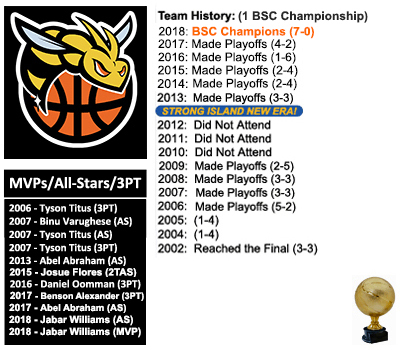 In the last 5 years, there have been 5 different BSC champions. That is amazing!! 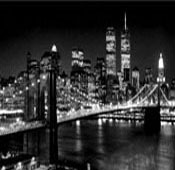 Look forward to seeing you there and hopefully the return of Brooklyn, Texas and Toronto! !